At the height of tomato season, a BLT should be as simple as possible: a little mayo, the requisite crisp bacon and lettuce and thick, juicy slices of freshly picked tomato. But even before this year’s tomato crop is ready for its close-up, chefs have found plenty of ways to riff on the BLT with tomato jam, fried green tomatoes or simply adding enough powerhouse ingredients that they still get a standout sandwich. The filling: Tomato, in some guise; lettuce or its kin; and if not bacon, something appropriately porky to substitute. The bread: Anything substantial enough to layer on the B, L and T but not so crusty you can't bite through in one big chomp. Acorn, Denver: In lieu of fresh tomatoes, chef Steven Redzikowski swaps in fried green ones and replaces traditional bacon with oak-grilled pork belly. He tops it with sambal aioli, arugula, avocado and a fried egg, and he’s got a beast of a BLT. 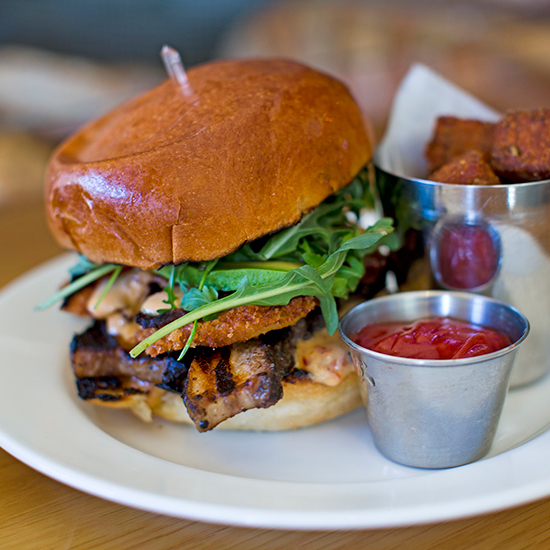 Post 390, Boston: Grilled Sriracha pork belly plays the bacon role in this sandwich, in between arugula and tomato jam. Layered avocado and sourdough bread give this Boston sandwich a bit of a California vibe. Oyamel, DC: At José Andrés's Mexican-inspired spot, the "Pancita y Jitomate" torta is clearly BLT-inspired: spiced “36-hour” Shenandoah pork belly with tomatoes, romaine lettuce and Dijon mayonnaise, served on a bolillo roll from La Flor de Puebla Bakery.